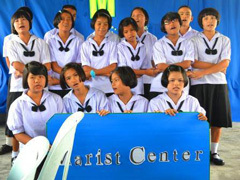 Director of Marist Mission Ranong, Fr Kevin Medilo SM, proudly advises of the opening of the new 'Marist Centre' in the southern Thailand city. 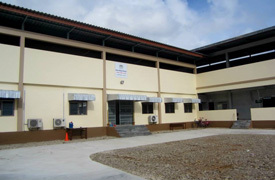 The facility brings new hope and enthusiasm for the children of thousands of Burmese migrant workers in the area, providing a multi-purpose learning and trade education centre to be blessed by the local bishop on Jun 27. See also the Marist Mission Ranong website. 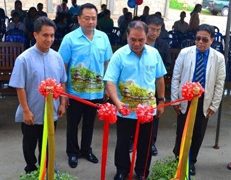 Above: Mr Pritcha Buaking, Director of the Ministry of Education in Ranong, at the opening of the Marist Centre. / MMR Director, Fr Kevin Medilo, (centre) with the engineer of the building (left) and a catholic parishioner (right) who helped build the parking lot and the field for free. Below, from left: Marist Centre today / two months ago. Fr Kevin Medilo with the centre-in-the-making in early March. As part of the Princess of Thailand's Education Programme, the MMR students performed a presentation to express MMR's apprevciation. / MMR's Health Team, headed by Kiwi volunteer, Kirsten Sloan (centre). One of the most astute residents of St Anne's Nursing Home, Hunters Hill,NSW, commenced her 100th year amongst friends, fellow-Marists and ex-students on May 25. Marist Sister, Sr Doreen McOscar SM, marked her 99th birthday with well wishes from many of the generations of women revering her extraordinary years of service to Catholic and missionary education. Beginning her teaching career at nearby Marist Sisters College, Woolwich, Sr Doreen went on to work in Rome, Fiji, and the Sisters' schools in Queensland and Merrylands, NSW. Happy Birthday, Sister! 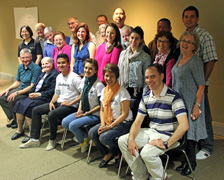 Marists gather at Villa Maria on May 22 to discuss issues and directions for Marist government internationally. / Fr Paul Cooney (left) explains an issue. 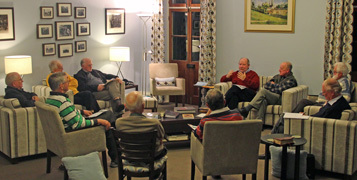 Members of the Australian province of Marist Fathers have begun a series of gatherings in several centres as part of an international review of Marist government in the Society of Mary. Former provincial, Fr Paul Cooney SM, is facilitating the meetings at Herston (Qld), Hunters Hill (Montbel and Villa Maria) and St Patrick's, Church Hill (NSW). The international review is being conducted by Australian consultant, Dr John Honner, who will present the findings of the 2-year review at the Council of the Society in Dublin, Ireland, in October. Inside there is the 'Colin Corner'. Now St Patrick's, Church Hill, Sydney, has the 'Colin Table' -- outside, in the courtyard every Sunday. 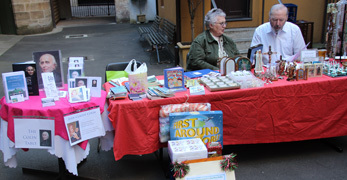 An initiative of pastoral associate, Sr Fidelis McTeigue SM, the table provides resources promoting the cause of Jean-Claude Colin to patrons of the popular piety and books stall. Free resources include the popular novena leaflet, illustrated children's booklet, notelets and bookmarks. Fr Donal Kerr's book on Fr Colin is available for purchase from the table. See also: News & Events on the Colin website. 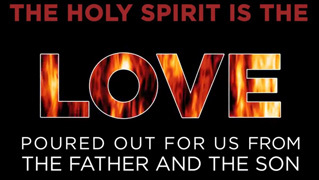 Simple teaching on the coming of the Holy Spirt, courtesy of YouTube. Click here. 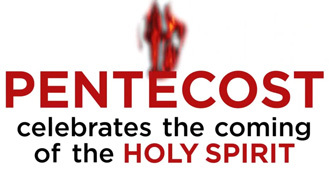 Pentecost blessings upon all our visitors! Xai, Kim, Fr Gavin, Kate Young (host family) and Angie. 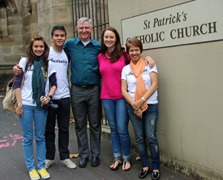 A quick trip from Sydney International airport brought three Filipino guests to the Marist Laity reflection day at St Patrick's, Church Hill, NSW, on May 11. Theme for the gathering was 'Challenges in spirituality - the ripple effect of mental health'. The visitors were well placed to contribute. Introduced by Kiwi missionary, Fr Gavin Foster SM, were his fellow workers at the Davao Mental Hospital (Mindanao, Southern Philippines), Angie Pacursa, her daughter, Xai, and Kim Panuayan. Xia and Kim are recent graduates in nursing and part of the 'Challenge 2015' project in Davao offering support to patients in the mental hospital. Angie is coordinator of the program. The group will spend five weeks in Australia, hosted by families of Marist Sisters College, Woolwich, students who visited Davao last year. The Oceania Marist province and Marist throughout Asia-Pacifc and beyond are mounring the death of Fr Lui Raco in Suva, Fiji, on May 06, aged 85. A Marist for 60 years and priest for 56 years, Fr Lui was one of the most respected and senior members of the Pacific province --teacher, pastor, formator, mentor, leader and friend. May he rest in peace. Australian Marist and author, Fr Paul Glynn, is leading a retreat for fellow Marists at Nasuku Retreat Centre, Levuka, on the Island of Ovalau, Fiji. His theme is the call to holiness articulated by Pope John Paul II in recent years. From Suva, Oceania Marist provincial, Fr Ben McKenna, reports: 'This is the first time Paul has been to Fiji: and, being 84, an old missionary of Japan, with his ample repetoire of stories, and strong and gentle faith, he has already had an impact - even before the retreat has begun'. Beginning on May 05 the 6-day retreat has attracted 20-25 Marists from the Fiji region. Fr Paul will return in August to give a retreat to the other 25 Marists of the Fiji Region. 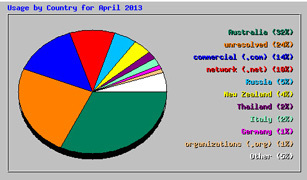 12,600 website visits from 103 countries were made during the month of April to www.maristfathers.org.au. Daily average was 419 visits (lowest daily figure 364; highest 579) representing 265,000 'hits' for the month. On average each visitor opened 6 pages and look at 17 files.. 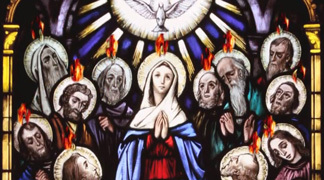 The European province of the Society of Mary has sent its latest newsletter. Download here. 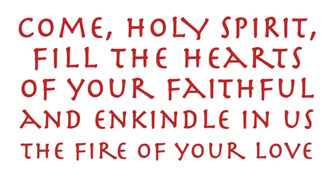 The Australian Catholic Social Justice Council has given us this this simple prayer. Download here (PDF download: four prayers on an A4 page).